One of the greatest things about making your own pasta, is that you can make pastas with different ingredients…flavored pastas!! In this recipe video, I show you how to make a pecorino and black pepper pasta that is absolutely awesome. In addition to the freshness and tender texture that homemade pasta pasta gives you, this version has some extra richness and spice from the black pepper and cheese. In fact, when I make this pasta, I generally serve it with a very simple sauce that really lets the pasta shine and be the main act. Regarding the quantities above. The egg to flour ratio is going to vary. You may need more or less flour…but remember it’s easy to add more flour (hard to take it away). 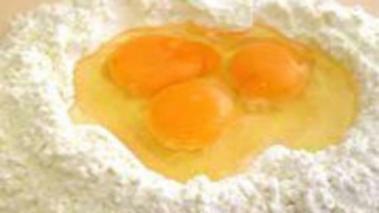 Generally you need about 2 eggs, per cup of flour, and that amount will yield enough pasta for 2 people. However, the recipe scales up very easily, and when I make pasta I tend to make a lot, and freeze what I don’t use. Form your well with the flour, and crack in your eggs. I like to whisk them together just a bit then add the black pepper and cheese. Again, whisk until the egg, cheese and pepper come together, and then incorporate the flour until the dough comes together. Watch me use the well method here. You can then cut the dough into whatever shapes you’d like. I live to make fettucini, pappardelle, and stuffed pastas like agnolotti, but this is great in any shape. Make a simple sauce and serve. Hope you enjoy it, and leave me a comment to let me know how it goes.